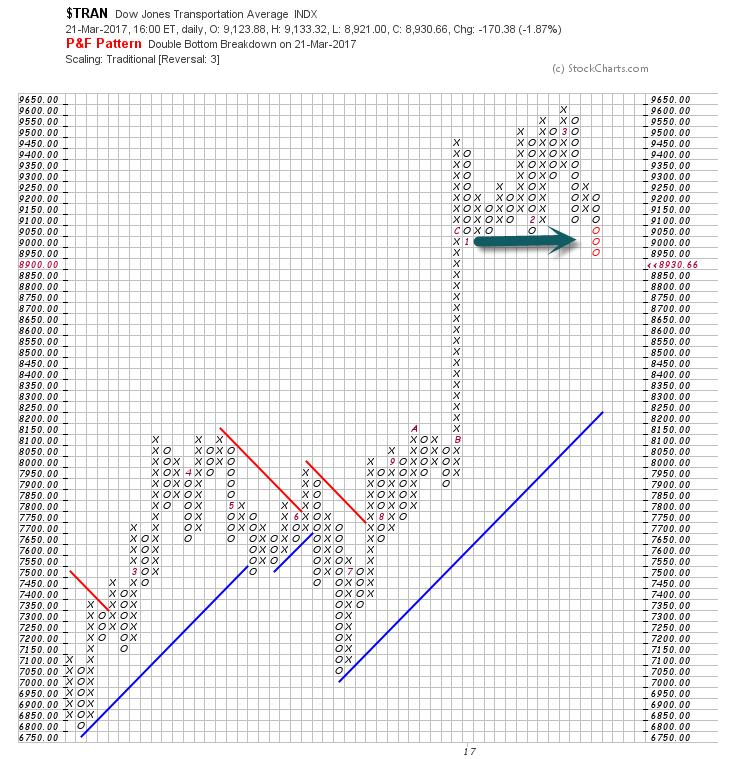 1.Talked About Transports Leading Down Earlier in Week…Down 2% Tuesday….6.7% Off Highs. Transports Break Below Sideways Post Trump Range. 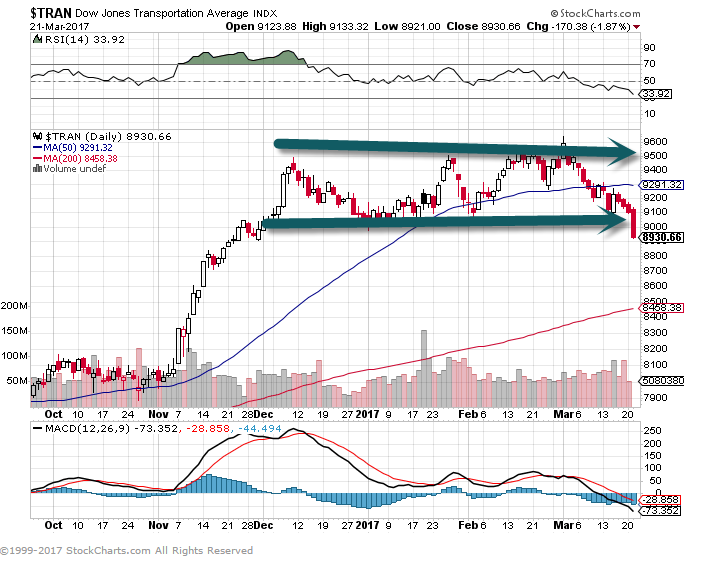 Transports Break Previous 2017 Lows. 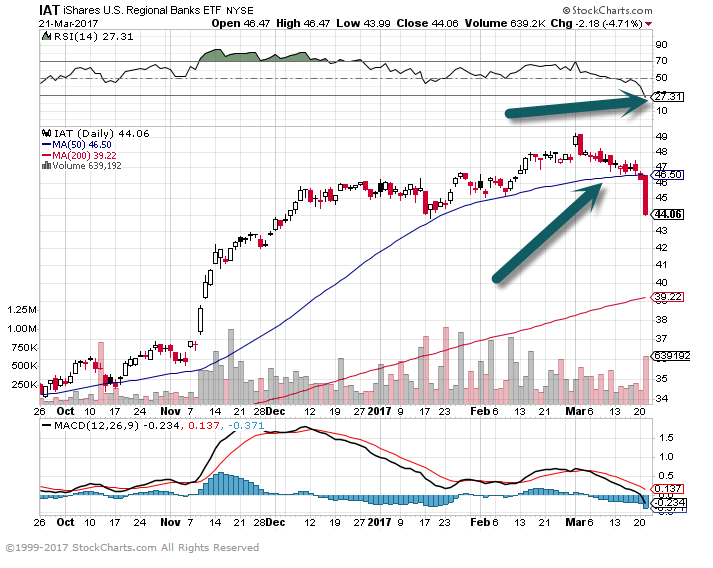 2.We Also Mentioned Regional Banks Starting to Lag S&P 2017…..Down Almost 5% Yesterday. From the Financial Crisis lows in March 2009, the global rally in equities has been primarily US-centric. While the MSCI US equity index is up over 250%, the MSCI Developed World Ex US (98.88%) and the MSCI Emerging Market (100.36%) indices are both up considerably less during this period in terms of US dollar adjusted returns, or the returns a US investor would have seen. 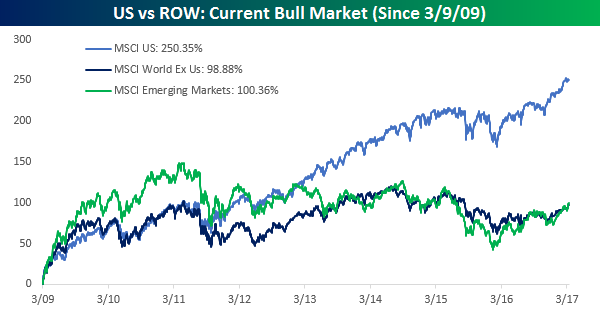 While the three indices performed relatively in line with each other in the first two or so years of the bull market, the US really started to break away from the pack beginning in 2013. The last several months, however, have been another story. The chart below is the same as above but shows dollar-adjusted returns only so far in 2017. Rather than leading the pack in 2017, the US is lagging. 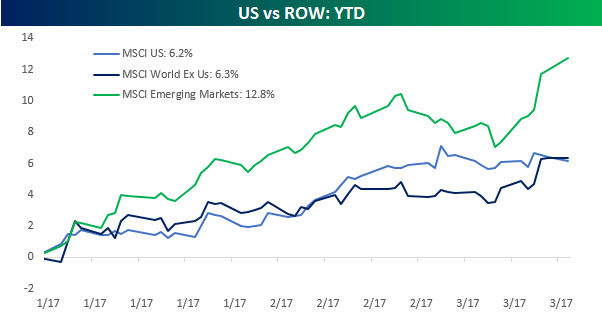 As shown, while the MSCI US index is up 6.2% on the year, the Developed World Ex-US index is outperforming the US slightly with a gain of 6.3%. The real showstopper has been the MSCI Emerging Markets Index which is up more than twice as much as the US and Developed World indices! 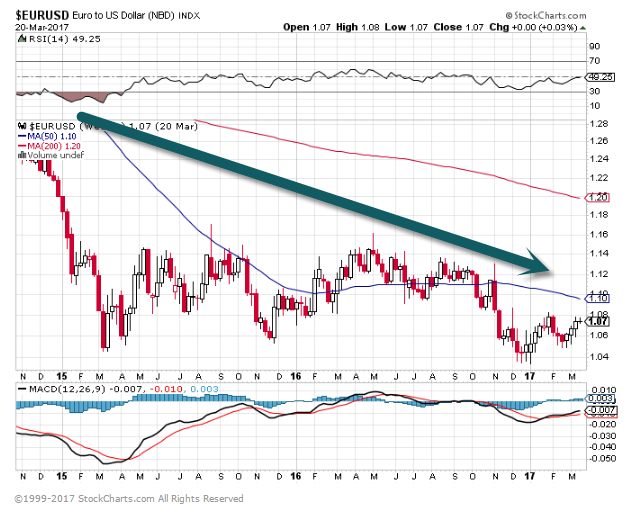 4.International Markets Started Outperformance as Dollar Faltered…. 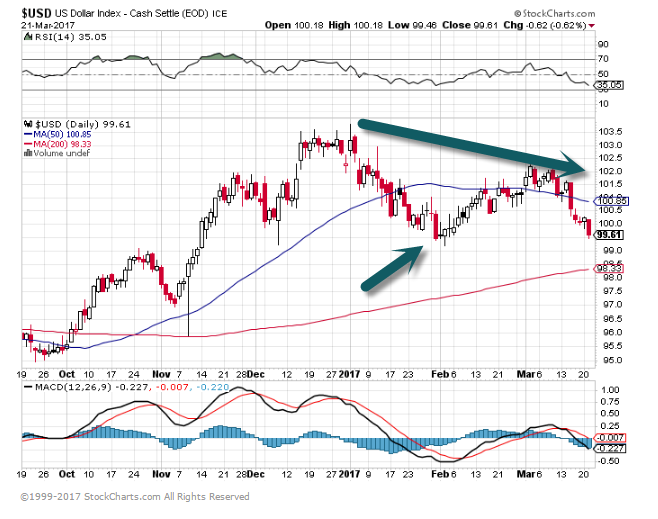 U.S. Dollar was a Crowded Long Play…Falling for Most of 2017. The S&P 500 index, closing Monday at 2,373, hovers near its all-time high. Total market capitalization of the 500 companies in the index exceeds $20 trillion, or 106% of US GDP. In the three-plus years since the end of January 2014, the index has soared 33%. And yet, over these three-plus years, even with financial engineering driven to the utmost state of perfection, including $1.7 trillion in share buybacks and despite “ex-bad-items” accounting schemes that are giving even the SEC goosebumps – despite all these efforts, the crucial and beautifully doctored “adjusted” earnings-per-share, perhaps the single most manipulated metric out there, has gone nowhere. 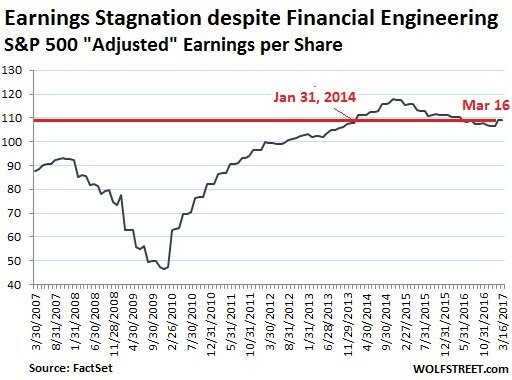 “Adjusted” earnings per share are back where they’d been at the end of January 2014. It’s a sad sign when not even financial engineering can conjure up the appearance of earnings growth. All companies report as required under GAAP (our slightly inconvenient Generally Accepted Accounting Principles). These earnings are often a loss or way too small and shrinking, instead of growing, and hence not very palatable. So most companies also report pro-forma, ex-bad-items, “adjusted” earnings, based on the companies’ own notions of what matters. Analysts and the media hype that metric. This is just a method of reporting the same results in a more glamorous manner. Then there’s financial engineering. Companies borrowed heavily over the past few years and used those funds to purchase their own shares. This hollowed out equity and left companies with piles of debt. Over the past three years, companies blew $1.7 trillion on share buybacks. This money was not invested in productive activities that would have expanded the company and the economy, and generated cash flow to service this debt. 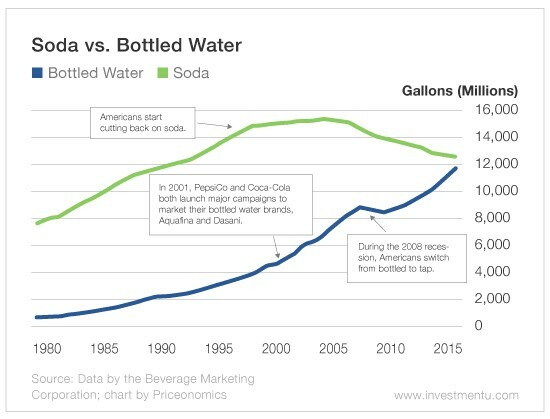 All it did was reduce the number of shares outstanding. This has the effect of increasing earnings per share (EPS) though the company didn’t actually make more money. Add this system of share buybacks to the system of “adjusting” earnings per share via reporting schemes, and the result should be a miracle of soaring “adjusted” EPS. But no. 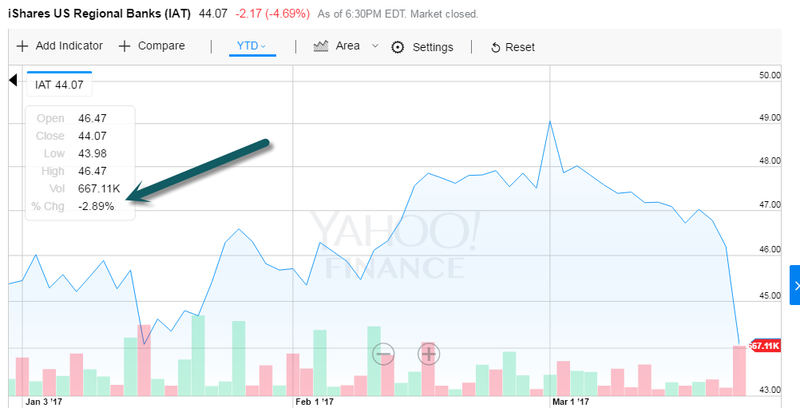 But over the same period, the S&P 500 index has soared 33%. What gives? I previously dissected the lack of growth in total adjusted earnings – not earnings per share, but total earnings for the S&P 500 companies. Since this is not a per-share metric, it excludes the effects of financial engineering, such as share buybacks. It showed that total earnings on a 12-month trailing basis in Q4 2016 were stuck at 2011 levels, though the S&P 500 index had soared 87%. 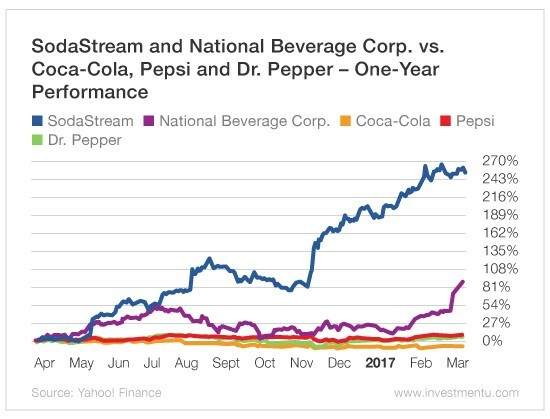 So financial engineering – share buybacks to reduce the number of shares outstanding – works, kind of: It made the results look less terrible. But even these expert financial engineering methods, at a cost of $1.7 trillion, couldn’t doll up results enough to show any kind of earnings growth over the past three years. Yet stocks have soared despite these miserable growth fundamentals. So what gives in this no-earnings-growth environment? This combination of flat earnings and soaring stock prices, and thus expanding P/E ratios, is not uncommon. It comes in cycles: periods of multiple expansion are followed by periods of multiple compression. The current cycle of year-over-year multiple expansion has lasted for 57 months, the longest on record. The prior three record cycles – which ended in 1987, 2000, and 2009 – turned into periods of multiple compression associated with blistering crashes. 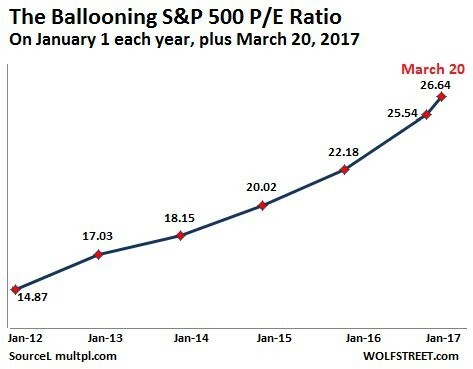 7.Investors Factoring Zero Percent Chance of Major Correction. 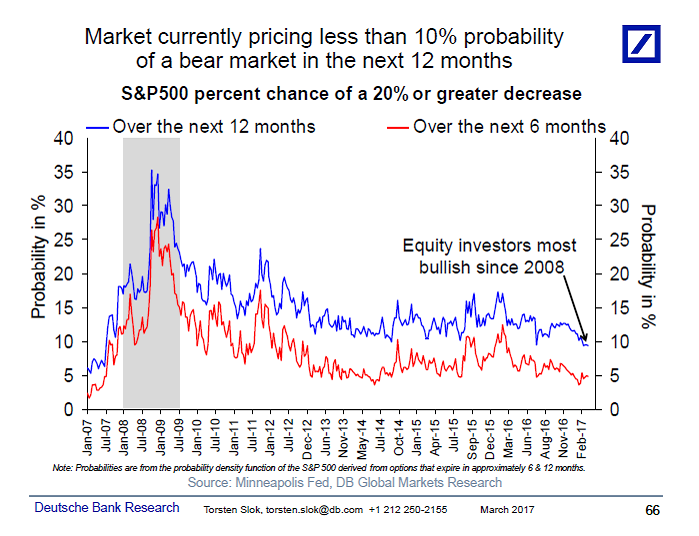 Despite enormous political uncertainty both in the US and Europe, stock markets continue to see very limited downside risks on the horizon with implied probabilities of a +20% correction in the S&P500 at the lowest levels since 2008, see chart below. Note: Index represents ratio of 12-months trailing enterprise value to Ebitda of the MSCI World Index and the VIX. It can’t be replaced by automation. It’s been heartening to see heightened interest in soft skills in response to rising automation and the shrinking half-life of hard or technical skills. I’m among those who believe soft skills and continuous learning will be what lift some careers while others stagnate. 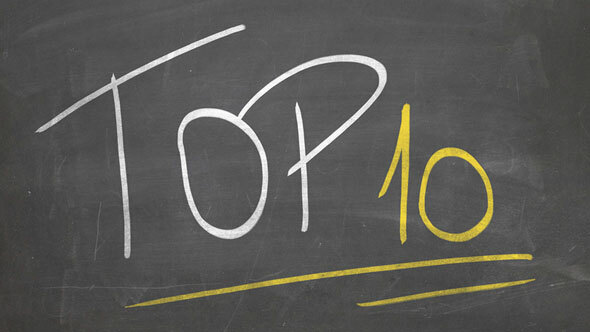 I’ll go one step further and suggest that the #1 soft skill to develop is to become an effective communicator. Bots and algorithms can’t provide context, analysis, and nuance the way a human can, but “better than a bot” is a pretty low bar to set for yourself. Regardless of your field, you are communicating constantly with colleagues, teams, partners, clients, stakeholders, etc., but are you as good at it as you could be? If not, you’re likely missing opportunities to sell in your ideas, focus your team, gain credibility and respect, reach your goals, and avoid a lot of wasted time and confusion. Have you ever emailed someone only to get a response that raises more questions than it answers? Not every email needs to be as beautiful and thoughtfully crafted as a Shakespearean sonnet, but it does need to be clear and thorough. One of the biggest flaws I see in written communications is a failure to provide context. You don’t need to include every detail, but it’s important for people to understand the background of what you’re saying, especially on those threads where new recipients get added halfway in. Similarly, rather than just hitting forward to blast a message out, consider how you could add value to the conversation and ensure recipients pick up on the points you wanted them to. Don’t assume people will get it. I also strongly recommend taking that one last read before sending. Misspellings, typos, and incorrect grammar may seem like no big deal among coworkers, but this stuff matters. Unclear or sloppy writing generates follow-up messages asking for clarity, and we all get enough emails and chat pings without having to send and read more in order to understand what someone is trying to say. You may never appear on a big stage, but you can still benefit from learning a few basics of public speaking. Before your next meeting, you can prepare and give careful thought to the ideas you need to communicate and how to best to reach your audience. Most of us only make that effort for “important” meetings, but every meeting is supposed to be productive time for groups to ideate, make decisions, solve problems, or develop plans together. And all of those activities require good communication. If you can’t clearly communicate why you’re meeting and what needs to happen next, you’re not likely to make efficient progress. And if you can’t articulate your point of view convincingly, you’re not likely to win many allies. Examples abound of listeners getting hung up on how something is said and totally missing (or dismissing) what was said, such as assuming a too-casual tone in a professional communication or trying so hard to “sound right” that you come across as inauthentic. To communicate effectively, you need to keep it simple and adopt a tone suited to your audience, message, and context. You’re already modulating your tone without even trying when you use language to explain your work at an industry networking event compared to how you describe your job to friends at happy hour or to your mom. If writing isn’t your vocation and you struggle to find the right words, don’t overthink it. Just start typing or speak out loud the point you’re trying to make, and you’ll often find the simple, familiar language you’d use in a business conversation works just as well on paper. Adding jargon and buzzwords won’t make you sound smarter, just more verbose. Poor communication consumes valuable time and headspace none of us can afford to waste and can even hold you back in your career. Make a point to follow great communicators and reflect on why their writing and speaking connects with you. Then slow down and pay attention to your own communications and see where you can emulate their skills. Notice when people ask questions about things you thought you’d already explained and look for patterns where people get tripped up following your thought process or misinterpret your intentions. To build your communications skills, you need to set your mind to it and practice. A lot. Becoming a great communicator won’t happen without effort and it won’t happen overnight, but it’s definitely a skill that will help you get ahead.